Today’s soldering processes are rapidly shifting. In the past decade, lead-free solder has been introduced and soldering components are continuing to decrease in size. Today, users no longer have to adjust heating temperatures of their soldering irons; thereby, burning the flux in their solder wire before having the chance to help the flow of solder (leading to poor solder joint quality, reduction in tip life, and increased chances of oxidization). Today, Thermaltronics has responded to the rapidly changing soldering industry, and old, conventional ceramic heating element technology is slowly fading. Curie Heat Technology is the solution. Thermaltronics Curie Heat Technology, “utilizes induction heating to bring the temperature to its Curie Point, which is set by the composition of the alloy. Once it hits Curie Point, the tip will lose its’ magnetic properties and idle at its set point ready for action. A phenomenon known as Skin Effect results in the heat being confined to the outer layer of the tip (heating from the outside/in) as opposed to conventional ceramic heating which is from the inside/out. Once the soldering tip makes contact with the solder joint, the tip will transfer heat across at a rapid rate and the solder joint will attempt to draw temperature away from the tip. Once the tip temperature starts to fall below its Curie Point temperature the tip realizes this and instantaneously regains its magnetic properties, the induction heating process starts again and keeps the tip at the stable temperature required,” (Thermaltronics, 2016). The aforementioned scenario, is why Curie Heat responds faster than conventional ceramic heating technology, which uses tip, sensor, and ceramic heating elements. This one step process is the main reason why Curie Heat responds faster than conventional ceramic heating technology. Additionally, traditional ceramic heating technology tends to be a longer process, as sensors detect a reduction in temperature and then communicates with the heating element, which then attempts to reheat the tip. Curie Heat Technology has many benefits across a wide spectrum for hand soldering jobs such as fine surface mount work (such as mobile devices and laptop devices). Get your hands on the Thermaltronics 13.56MHz soldering systems, such as TMT-9000S-1 (100-110 VAC) or TMT 9000S-2 (220-240 VAC), and discover the difference between innovation with Curie Heat Technology and out-dated, conventional ceramic heating soldering systems. At Janel Online, we can’t get enough of Thermaltronics 9000’s soldering stations. 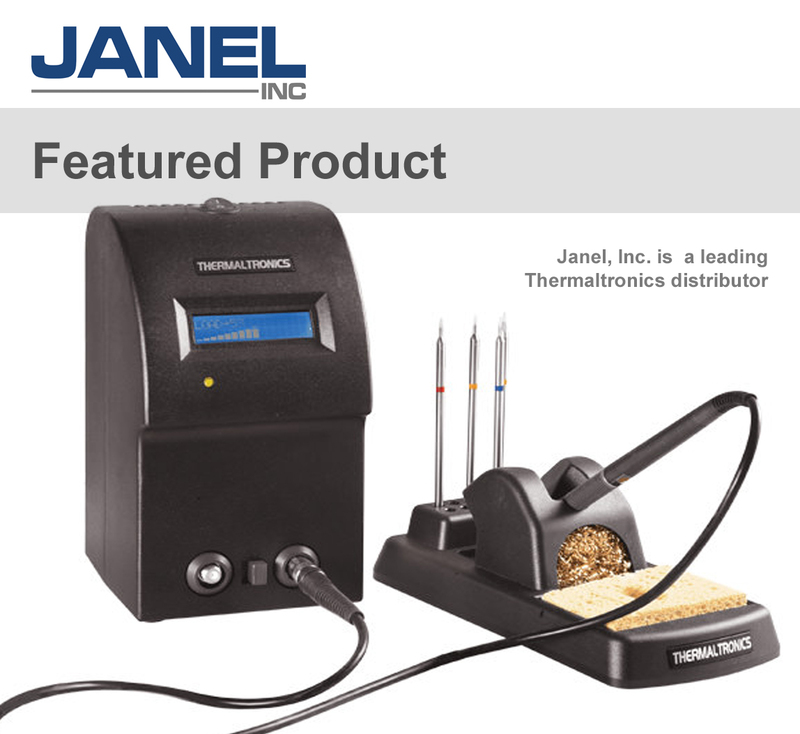 From experience in talking to many of our customers, the setup of these soldering station suites, are quite different compared to traditional soldering irons and stations. The reason being, there are no adjustments for temperature, as all of the temperature controlled application is based on the thermal load demands within the soldering cartridge’s temperature range. Main Power Unit: Enclosure is entirely metal and includes heat-sinking integrated into the chassis. The front of the unit includes a dual row display on an LCD screen. Information on the LCD, displays information such as the current thermal load. Additionally, the Thermaltronics 9000 features 2 output switches for multiple configurations. The Soldering Handpiece: The silicone wire for the power supply is very agile and has a nice length. Additionally the changing of tips is exceptionally simple, as there is no locking ring. Tips effortlessly slide in and out of the barrel and secure at the base. Users find the connection to be exceptional. The Soldering Base Stand: While putting the soldering iron in the soldering iron’s stand, one will find it to be very secure, with minimal movement.